Chemically-induced pupil contraction may soon emerge as an alternative treatment for patients with presbyopia, reports a new study in the September 2015 Eye & Contact Lens. Researchers in Egypt investigated the use of a parasympathomimetic drug (carbachol) and an alpha agonist (brimonidine) in a double-masked, randomized placebo-controlled clinical trial involving 48 naturally emmetropic and presbyopic subjects. A treatment group (n=30 eyes) received a single dose of carbachol 2.25% plus brimonidine 0.2% eye drops, and a control group (n=18) received placebo drops. Silicone hydrogel contact lenses may limit absorption of certain anti-infective agents used to treat ocular surface diseases, reports a new study in the September 2015 Eye & Contact Lens. Check out more articles from the November issue of RCCL here! Generic Drugs: More than Meets the Eye? The optometrist’s role in comanagement of cataract and refractive surgery has expanded beyond mere screening and referral to active engagement in pre- and post-op care. And the line between these two previously distinct surgeries continues to blur as the refractive component becomes more central to patient expectations following cataract surgery. 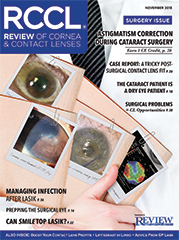 To help optometrists meet surgical challenges both old and new, the November issue of Review of Cornea & Contact Lenses is devoted to exploring these responsibilities. Below are 20 pearls shared by experts in the field. For more detail, click through to read the original articles for each.